No need to choose between a beverage refrigerator or a wine cooler, with the EdgeStar 24 Inch Built-In Wine and Beverage Cooler with French Doors (CWB1760FD) you get the best of both worlds. 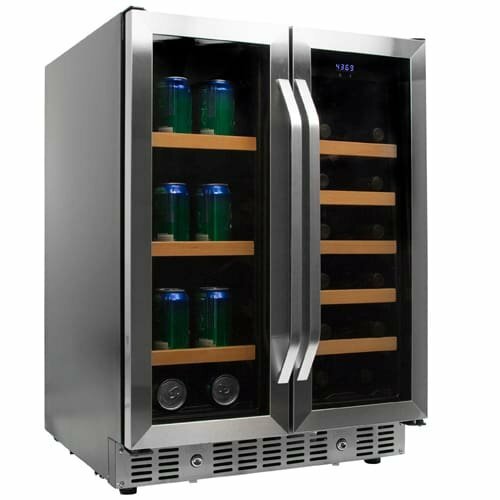 You can chill and store up to 60 beverage cans in the left temperature zone and up to 17 wine bottles in the right zone. Store Beverages & Wine Bottles: Dual zone operation allows you to choose different temperature settings for your beverage and wine storage yet store them within the same unit Built-In Capable: Front ventilation allows for flush-with-cabinetry or undercounter installation while the fully finished black cabinet allows for freestanding use as well Sleek Design: The stainless steel trimmed doors, slide-out wood trimmed shelving, and soft LED lighting add to an overall great presentation of your beverages Dual Zone Operation: You can store both wine and beverages at their perfect storing or serving temperature due to this unit's left zone temperature range of 36 - 43�F and its right zone temperature range of 41 - 72�F Digital Display & Touch Controls: Set and monitor the temperature of each zone using the touch control panels and digital displays Even Cooling: You�ll never have to worry about hot spots or uneven cooling with this unit due to its powerful circulation fans, which work with the compressor to evenly distribute cool air throughout ADA Compliant: This beverage cooler�s shorter height makes it ideal for ADA-accessible homes and office spaces Preservation Glass: With dual paned, tempered glass doors, your collection will be protected from any potentially harmful outside elements. Safety Lock: You can rest assured that your wine collection is safe due to this unit�s integrated safety lock Dimensions: 32" H x 23.5" W x 24.4" D; leveling legs can be adjusted to add up to 2" in height. PLEASE NOTE: Delivery will be curbside, inside delivery is not available. A valid phone number is required for delivery purposes, please ensure the correct phone number is provided in your shipping information when placing this order. If you have any questions about this product by EdgeStar, contact us by completing and submitting the form below. If you are looking for a specif part number, please include it with your message.